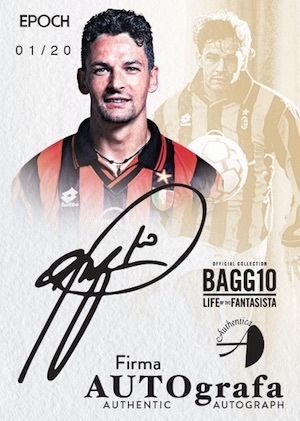 2016 Epoch Authentica Roberto Baggio Official Collection: Life of the Fantasista (Baggio is written as "Bagg10" in official name) might be a mouthful, but the limited and high-end product pays homage to one of the all-time greats in the world of soccer. 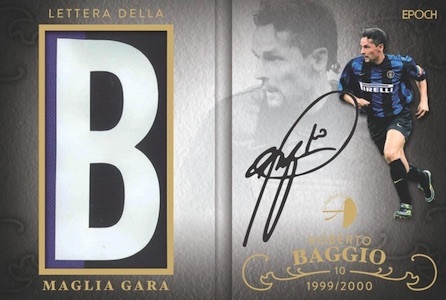 Every mini box promises one autograph or relic from Baggio. An Italian legend, most fans of the game are likely familiar with the prolific footballer. 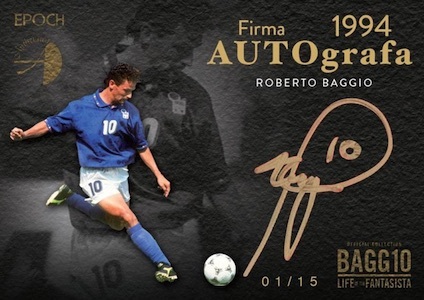 If not, 2016 Epoch Authentica Roberto Baggio Official Collection: Life of the Fantasista provides a good refresher. 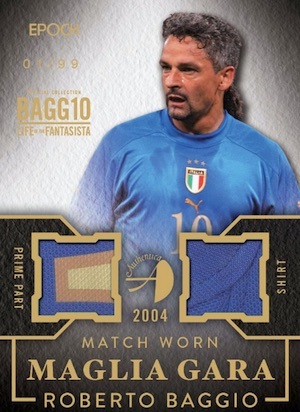 The base set covers notable events for Baggio, on and off the field, and one base card is found in each box. 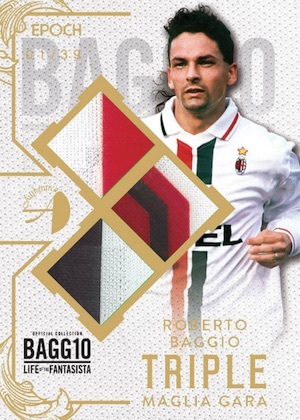 Not just limited to the pitch, these numbered base cards feature many images that tell the story of Roberto Baggio, the man. 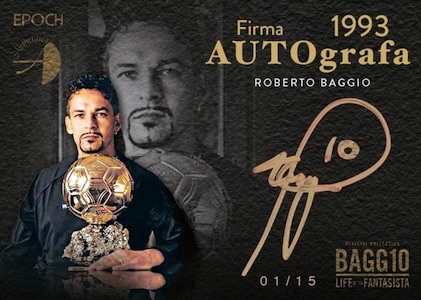 Building on the base set, the key draw for most collectors is the hits and 2016 Epoch Authentica Roberto Baggio Official Collection: Life of the Fantasista has plenty. Split between relics, autographs and autograph relics, all premium inserts are numbered and all signatures are on-card. Among the options are Firma Autografa that covers relevant points in his career with a hard-sgined autograph. 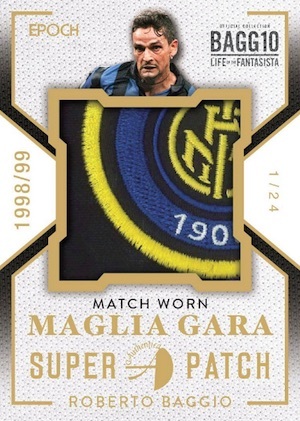 Lettera Della Maglia Gara pairs an autograph and letter relic in a booklet card. For those that are unclear, "Maglia gara" is Italian for "game shirt." A first for soccer collectors, match-worn captain bands for Baggio are included in 2016 Epoch Authentica Roberto Baggio Official Collection: Life of the Fantasista. 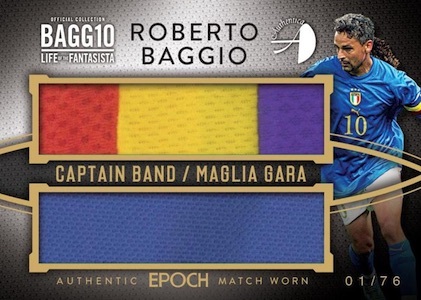 Signed Match Worn Captain Band utilizes an auto-relic pairing while Captain Band / Maglia Gara is a dual relic insert. Other relic choices include Maglia Gara Super Patch, Dual Maglia Gara, and Triple Maglia Gara. The authenticity of all Roberto Baggio autographs in the set are guaranteed by his agent/management at Kronomark & Partners. 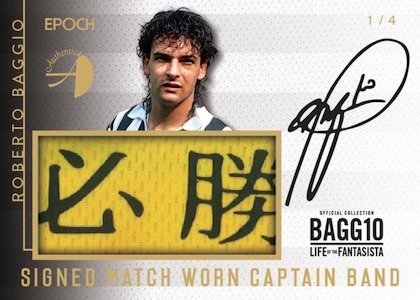 Limited to just 400 master boxes, 2016 Epoch Authentica Roberto Baggio Official Collection: Life of the Fantasista will be tougher for many to locate as it does not appear as though it will be actively distributed outside of Japan. These are not the first officially licensed autographs for Baggio as he has previously signed for Panini in both their 2014 Prizm World Cup and 2015 Select Soccer lines. 2015-16 PANINI SELECT SOCCER CASE FACTORY SEALED 12 BOX RONALDO MESSI AUTO ?